Hey there, EPO. I've been browsing your forums for a while now, and they're very useful when I have questions that need answering. "Hey everyone, thank you so much for continuing to support me as a short Canadian actor. I hope this is a place for us to come together and hang out in virtual land. It is kinda like you are in my living room, because that is where I am right at this moment. Weird. Or cool. I'm not so sure." Can anyone shed some light on this? Normally I would just assume that it was a silly impersonator, but how in the world did they get these pictures of her? Last edited by JimH on Apr 11, 2011 2:35 am, edited 4 times in total. Nevermind, I must be blind. Last edited by JerseyDevil65 on Jun 22, 2009 11:53 pm, edited 1 time in total. The first photo doesn't look like her, but the second does. Also, there were some photos posted online several months ago of Ellen walking with a dog from a visit to a vet. The dog in those photos looks like the dog in these new photos. Could be. I noticed this too! All the press pictures of her (which made me think it was a dedication page also) were suddenly deleted and replaced with those. Weird. The pictures are obviously of her, but something about the message doesnt seem right. I would like to know too. kookycat wrote: The pictures are obviously of her, but something about the message doesnt seem right. Am I the only one who thinks its not Ellen in those pics? I'm sure I could be wrong but, something about those pics just doesn't look quite right. .... And I really do think those pictures are of her. 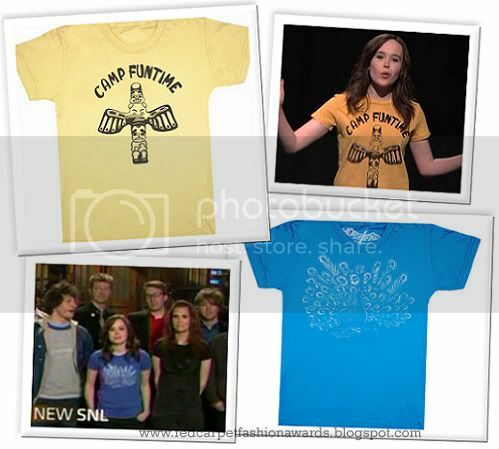 That definitely looks like her, it even looks like she's wearing the t-shirt she had on SNL. But this is just weird... I would never have thought she would post photos like that on facebook. But if you scroll down and jump to the very first comment and event, you will see that this profile has been created on February 23, 2008 or a few days earlier (i.e. during the Oscar season last year), ergo it's most probably a fake cause Ellen was totally busy at that time. Now, there's still the question how this person was able to get these private photos. Either one of Ellen's personal items like an online (mail) account or her blackbarry was hacked (like the one from Miley Cyrus for example) or one of her friends shared them on MySpace, Facebook or somewhere else. Personally, I highly doubt she would publish such photos in public by herself. Overall, I can't say for sure if this is a fake or a real thing. However, I think it's very suspicious that the account owner never wrote something on the wall before, but posted some private stuff AND a message to the fans yesterday. Additionally, we all know that Ellen is currently preparing herself for Inception and I'm pretty sure she has more important things to do at the moment. Thanks for finding all that out, Dominik. That's what I think as well. I just wanted to let EPO know since I thought this was a little strange. Yeah I've been thinking that too, haven't seen her in a while. I reported the page to facebook, since it's most likely not really her. Oh! and Welcome welcome to EPO, Hope you enjoy being here. Our dreams keep us youthful and alive,the very breath which helps us thrive. Our dreams are tangible and they keep us optimistic. It's intangible when our dreams go from a dream to becoming realistic. I doubt very highly it would be her own page. Didn't she say she deleted hers a long time ago in an interview? She wouldn't make a public page, she's a bit to private for that. I drew it in OpenCanvas using a photo I saw of her in the gallery. Hey everyone, bear with me and this facebook page, I am horrible at taking pictures and all that good stuff. I have been in England shooting a film. Been listening to an awesome debut album from a band here called beastellabeast. You should check it out! Their album is available on iTunes. They are kinda crazy and like nothing else right now. Feels like magic to me. I hope everyone is well and enjoying the summer! Besides "shooting a film" (>Inception), she also refered to a band called "Beastellabeast". One of the members of this group is Beatrice Brown, who played Nancy in "Mouth to Mouth" and Ellen is friends with. I don't think this is an accident. I've tried to get a confirmation and verify if this account is real or not, but all people (who could possibly answer this) aren't willing to talk to me at the moment. But with this "new fact" in mind, I think it's safe to say it's Ellen who's writing these entries. I read her other updates and I have to agree with you dom.